Additional living space can bring more value and enjoyment to your home. While attics differ from home to home, there are some basic tips to consider when renovating this part of the house. Before beginning any renovation work in your attic, consult with a professional about any necessary changes to the structure and the permits required to do so. Typical renovations to attics need to provide a minimum height and width of seven feet, and 70 square feet of floor space. Attics don’t generally offer a great deal of floor space and ceiling height. You can increase the space in your attic by adding a dormer, which is a window structure that protrudes from the roof slope to provide more headroom space in the attic. Dormers range in sizes, so decide which will work best for you and your existing structure. 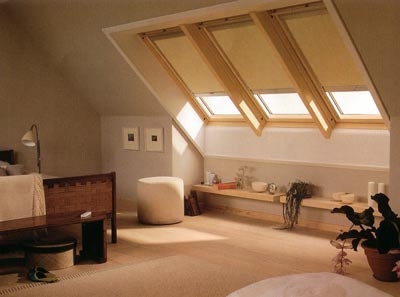 When deciding on windows for your attic, look for energy efficient products that will help you save on your monthly utility costs. Unused attics do not usually provide the support needed for general use. You will probably have to add floor supports in order to make the space sound. Be sure to contact a professional to make sure that your new space will meet the building codes for you area. You will have to determine how you plan to access your attic space. Even a small staircase requires enough room to climb them safely. An architect or construction engineer will be able to give you the advice you need to comply with building codes. To safely use the stairs, consider installing a window near the top to see each step clearly. Determine how you are going to use your new attic space and organize it accordingly. A well organized room will keep you from wasting any space and make the room more enjoyable. Well designed wall shelving can provide you with the space you need to store your belongings. There are also many furniture pieces that double as storage compartments. From under-the-bed drawers to storage ottomans, there are a wide range of products you can use to keep your attic space organized. Your attic is located at the highest point of your home and will need to offer a means of escape in the event of an emergency. Determine the best route for an emergency exit. There are many reliable safety products that can offer you a safe and secure exit through an attic window. If you decide to use one of these products be sure to keep it in a location that is easily accessible. Your new space could easily become damaged from moisture and water. Before you begin adding the walls and flooring, ensure that the ceiling is properly installed and that you have the necessary barrier to prevent roof water from entering your new space. To keep your attic space enjoyable, you will need to control the air temperature. You can choose between extending your current heating and cooling system or using a portable unit. Heated flooring is an effective way of making your attic comfortable, but you will have to get advice from a professional about installing it properly. If you choose to use a portable unit, make sure that the product meets safety standards. Server responsed at: 04/22/2019 4:51 p.m.